Harvest is underway and a few issues stemming from the unusual weather patterns last summer are coming up. On September 30 the Iowa Department of Agriculture and Land Stewardship (IDALS), as the state representative for the U.S. Food and Drug Administration, issued a statement saying that grain submerged (over the grain) in flood waters was to be considered contaminated and therefore not eligible for entry into food-feed markets. Ethanol is a feed market because of the dried distillers grains with solubles (DDGS). This is the same policy that was used for grain in storage that was submerged in 2008 by the eastern Iowa floods. The logic is that, in addition to in-field mold issues (see example below), flood waters can contain many contaminants from a wide variety of sources. The release and accompanying public health fact sheet are posted on the Iowa Grain Quality Initiative website. Take safety precautions when knocking this corn down; do not run it through a combine or use a stalk shredder — doing so would increase fugitive dust even more. The IDALS/FDA statement allows adjusters to consider the grain of no value in the crop insurance process. In the future, weather challenges may continue to create food safety situations; expect that grain will be considered in the same way as any other food ingredient as efforts to maintain food safety increase. Both corn and soybeans are likely to be harvested in warm weather this year. Be sure to cool the grain immediately after harvest to prevent spoilage from starting, even in the relatively drier grain this year. The dew point is a good indication of cooling potential; lately dew points have been in the 40s and 50s even with temperatures in the 70s and above. Low humidity air has good cooling potential as it evaporates water from grain. Soybeans are particularly at risk because we tend to think of them as safe for storage when they are harvested below 13 percent moisture, and therefore sometimes put them in non-aerated or poorly aerated storages. If unaerated storage must be used, only put cool, dry grain in there. The plant diseases that affected corn and soybeans this year may not have a large effect on grain quality, other than seed size and fill. However, stalk rots are common and lodged corn may require early harvest even though the warm weather could produce more in-field drydown. Again this creates the need to pay attention to grain temperatures while in storage and incorporate extra cooling cycles. 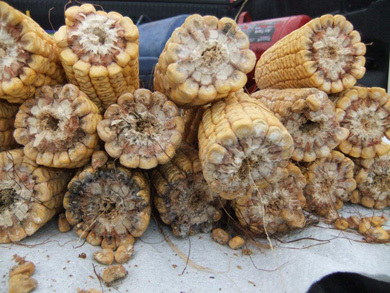 In 2009, the common practice of storing moderate moisture corn without drying (up to 19 percent) did not work well because the overall corn storage quality was poor; this year the risk is warm corn starting to spoil if not cooled. 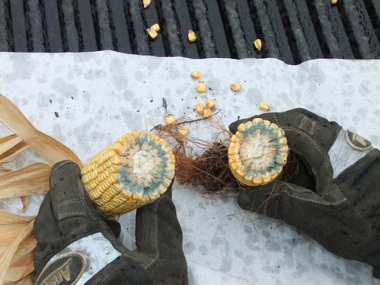 Nitrogen deficient corn will likely have lower protein. Early indications are that soybean protein and oil will be good, approximately at the long term averages of 35 percent protein and 19 percent oil. Reminder: Corn from different crop years should never be mixed in storage. Instability results. With the large amount of the poorer quality 2009 corn still in storage, grain will be blended when sold, but this should not be done before storage. Use test weight as a guide to determine which 2010 grain should be kept and which should be marketed or used quickly. Corn less than 54 lb/bu will have progressively poorer storage properties; likewise heavier corn will have better storage properties. With the large amount of damaged corn in storage from 2009, the market cannot accept more condition problems from 2010 corn. Charles Hurburgh is an agricultural and biosystems engineering professor who manages the Grain Quality Research Laboratory and the extension-based Iowa Grain Quality Initiative. He can be contacted at (515) 294-8629 or by email at tatry@iastate.edu. Roger Elmore is a professor of agronomy with research and extension responsibilities in corn production. He can be contacted by email at relmore@iastate.edu or (515) 294-6655. Alison Robertson is an assistant professor of plant pathology with research and extension responsibilities in field crop diseases. Robertson may be reached at (515) 294-6708 or by email at alisonr@iastate.edu. Links to this article are strongly encouraged, and this article may be republished without further permission if published as written and if credit is given to the author, Integrated Crop Management News, and Iowa State University Extension and Outreach. If this article is to be used in any other manner, permission from the author is required. This article was originally published on October 3, 2010. The information contained within may not be the most current and accurate depending on when it is accessed.